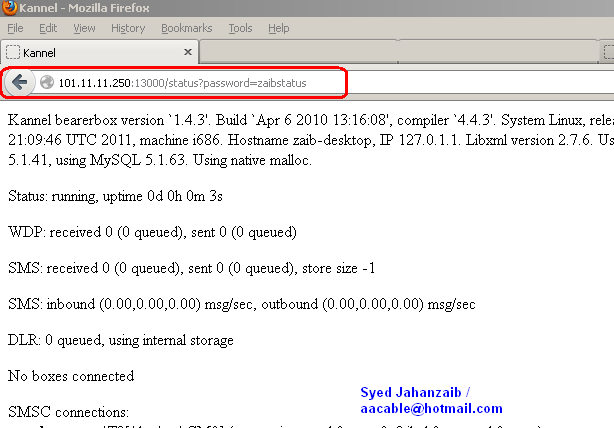 Howto configure your Local SMS HTTP Gateway using KANNEL on Ubuntu | Syed Jahanzaib Personal Blog to Share Knowledge ! As per web defines: Kannel (http://www.kannel.org/) is one of the most popular open source WAP/SMS Gateway, because its very good performance to handle a huge SMS. Kannel supports many modem’s brand even generic modem, also support multi modems (modem bank). After some testing, I have found Kannel one of the best , fastest SMS and WAP gateway among other open source sms gateways , capable of handling several hundreds of requests per second. As you can see the modem is detected on ttyUSB1 port. Open two terminal windows and issue below commands in each terminal box in the following order. NOTE: Change the IP / ID + Password = and number to match your local configuration. The result would be similar to the following . . .
brilliant. have been wanting to do this myself but didnt know how! 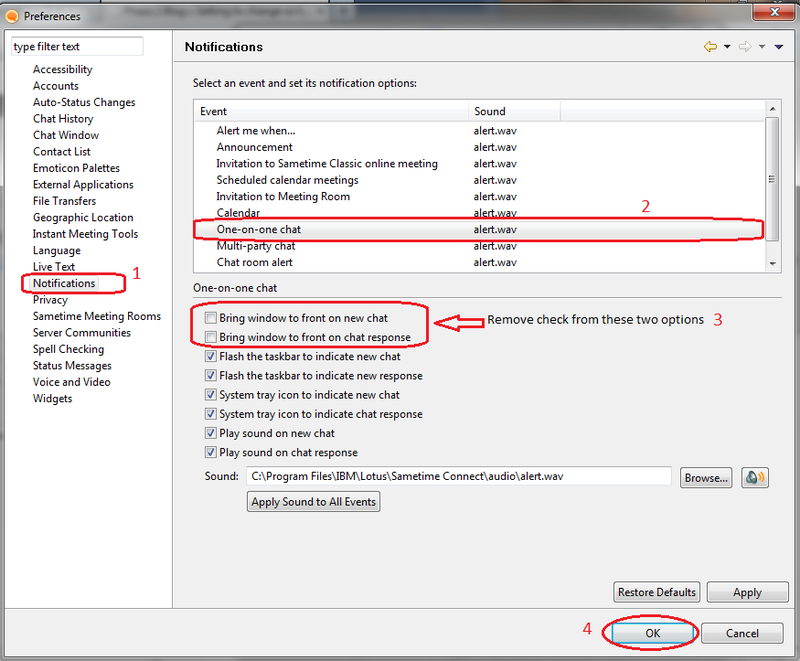 I’m not sure if I’m doing someting wrong but the sent sms dust get’s queued. If I sent a sms through gammu, it works fine – so my modem is working! 2012-12-27 12:31:04   DEBUG: Thread 4 (gw/smsbox.c:obey_request_thread) maps to pid 1371. 2012-12-27 12:31:04   DEBUG: Thread 5 (gw/smsbox.c:url_result_thread) maps to pid 1371. 2012-12-27 12:31:04   DEBUG: Thread 6 (gw/smsbox.c:http_queue_thread) maps to pid 1371. 2012-12-27 12:31:04   INFO: Connected to bearerbox at localhost port 13001. 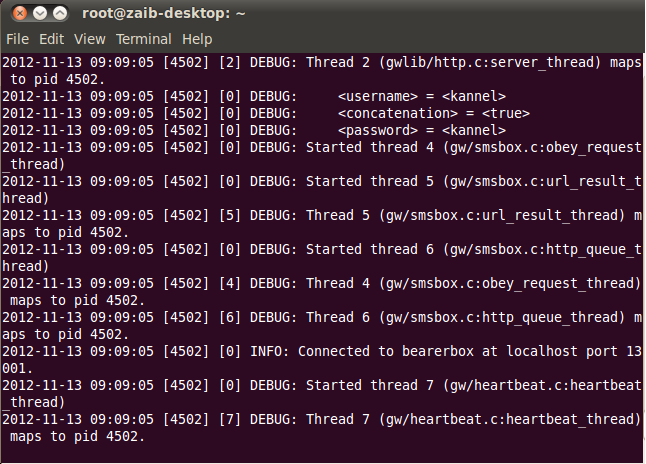 2012-12-27 12:31:04   DEBUG: Thread 7 (gw/heartbeat.c:heartbeat_thread) maps to pid 1371. 2012-12-27 12:31:13   DEBUG: HTTP: Creating HTTPClient for `192.168.111.253′. 2012-12-27 12:31:13   DEBUG: HTTP: Created HTTPClient area 0x8b03a00. 2012-12-27 12:31:13   DEBUG: HTTP: Resetting HTTPClient for `192.168.111.253′. 2012-12-27 12:32:13   DEBUG: Timeout for fd:24 appeares. 2012-12-27 12:32:13   DEBUG: HTTP: Destroying HTTPClient area 0x8b03a00. 2012-12-27 12:32:13   DEBUG: HTTP: Destroying HTTPClient for `192.168.111.253′. Kannel bearerbox version `1.4.3′. Build `Apr 6 2010 13:16:08′, compiler `4.4.3′. System Linux, release 2.6.32-38-generic-pae, version #83-Ubuntu SMP Wed Jan 4 12:11:13 UTC 2012, machine i686. Hostname ubuntu.hartjies.co.za, IP 192.168.111.5. Libxml version 2.7.6. Using OpenSSL 0.9.8k 25 Mar 2009. Compiled with MySQL 5.1.41, using MySQL 5.1.66. Using native malloc. I Think I found the cause – I have changed the init-string = “AT+CNMI=2,2,0,1,1” to “AT+CNMI=2,1,0,0,0”. 2012-12-27 15:03:11   DEBUG: Thread 7 (gw/bb_smscconn.c:sms_router) maps to pid 2677. 2012-12-27 15:03:12   INFO: AT2[/dev/ttyUSB1]: AT SMSC successfully opened. I used same configuration as described by syed jahazaib and its working absolutely fine for me. I just need one more that how to configure it, so I can send USSD command through it. 2014-07-07 15:39:22   DEBUG: sms_router: time to sleep 30.00 secs. 2014-07-07 15:39:52   DEBUG: sms_router: time to sleep 30.00 secs. 2015-01-11 20:08:26   INFO: Added logfile `/var/log/kannel/bearerbox.log’ with level `0′. 2015-01-11 20:08:26   INFO: HTTP: Opening server at port 13000. 2015-01-11 20:08:26   DEBUG: Thread 1 (gw/bb_http.c:httpadmin_run) maps to pid 32368. 2015-01-11 20:08:26   DEBUG: HTTP: No clients with requests, quitting. 2015-01-11 20:08:26   INFO: BOXC: ‘smsbox-max-pending’ not set, usingdefault (100). 2015-01-11 20:08:26   DEBUG: Thread 1 (gw/bb_http.c:httpadmin_run) terminates. 2015-01-11 20:08:26   DEBUG: Thread 2 (gw/bb_boxc.c:sms_to_smsboxes) maps to pid 32368. 2015-01-11 20:08:26   DEBUG: Thread 3 (gw/bb_boxc.c:smsboxc_run) maps to pid 32368. 2015-01-11 20:08:26   INFO: Set SMS resend frequency to 60 seconds. 2015-01-11 20:08:26   INFO: SMS resend retry set to unlimited. 2015-01-11 20:08:26   INFO: DLR rerouting for smsc id disabled. It is an excellent article. Jazal Allah. I would really appreciate if you can guide us on how to start the kannel and sqlbox on ubuntu 14.04 reboot. you can install on the same server as the radius manager ? 2015-05-17 19:57:20   ERROR: Group does not contain variable ‘group’. 2015-05-17 19:57:20   ERROR: Error found on line 17 of file `/etc/kannel/kannel.conf’. 2015-05-17 19:57:20   PANIC: Couldn’t read configuration from `/etc/kannel/kannel.conf’. i am trying to install kannel on my raspberry pi 2. But i am getting this error.Do you have any idea to fix this error. 2015-12-22 13:22:43   INFO: AT2[/dev/ttyUSB0]: AT SMSC successfully opened. 2015-12-22 13:23:05   DEBUG: Thread 8 (gw/bb_boxc.c:function) maps to pid 3099. 2015-12-22 13:23:05   DEBUG: Thread 9 (gw/bb_boxc.c:boxc_sender) maps to pid 3099. 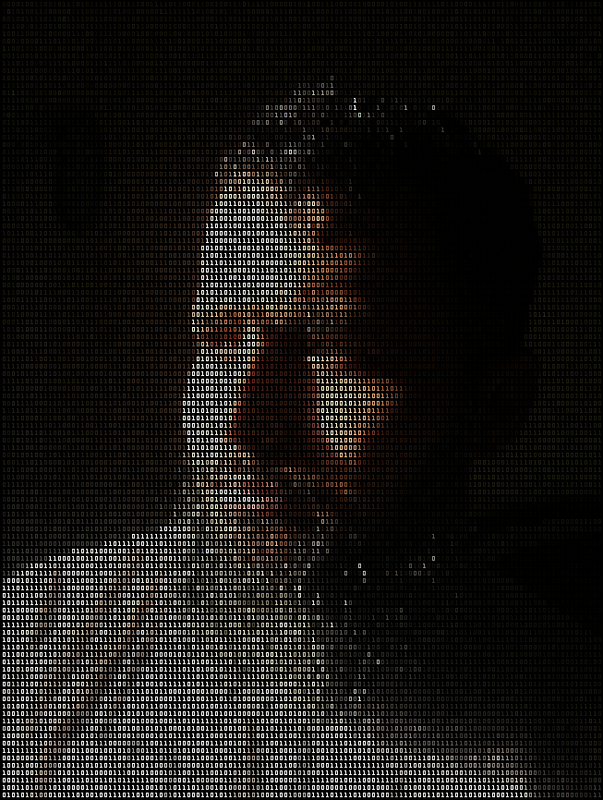 2015-12-22 13:23:30   DEBUG: sms_router: time to sleep 30.00 secs. Thank you so much for this, Please what is the function of the Teltonika Modem. 2016-05-29 17:46:23   DEBUG: AT2[zaibgsmid]: failed to get message 30. 2016-05-29 17:55:03   DEBUG: AT2[zaibgsmid]: failed to get message 30.
check your modem and sim status. you can use bulk sms provider scripts too. unfortunately I have not worked with 2 modems with single kannel/playsms box. Post your query at playSMS forum, surely you may receive good reply on it. 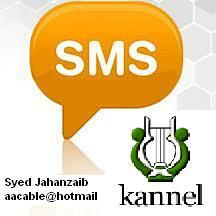 How to configure Local SMS HTTP Gateway using KANNEL on CENTOS 6.9? I have not made any guide for centos. try to use Ubuntu. its more user friendly then centos. when i run “sqlbox -v 0 /etc/kannel/kannel.conf” i receive the below panic message. i have been searching on google for several days but couldn’t find any solution. 2017-05-25 10:58:53   DEBUG: Kannel sqlbox version `1.4.4′. Build `Apr 5 2016 13:32:05′, compiler `5.3.1 20160330′. System Linux, release 4.4.0-77-generic, version #98-Ubuntu SMP Wed Apr 26 08:34:02 UTC 2017, machine x86_64. Using OpenSSL 1.0.2g 1 Mar 2016. Compiled with MySQL 5.7.11, using MySQL 5.7.18. 2017-10-02 18:05:02   ERROR: AT2[zaibgsmid]: Initialization of device failed. try changing the baud rate of device in the kannel config first. Support, am trying to setup my sms gateway but it seems the instruction on sending is clear. 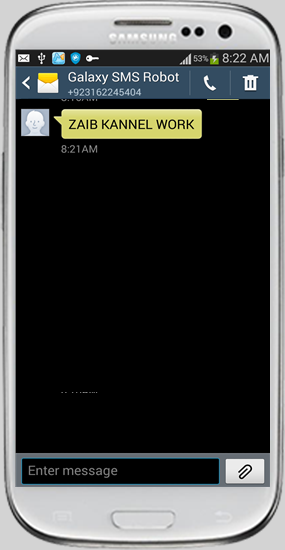 is there a way i can allow the receiver of the sms to reply back to it…then am able to view the replied msg in kannel?